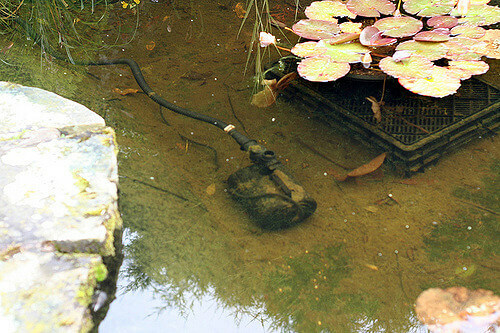 Although newer pond pumps have become more dependable and efficient in terms of energy, they are subject to Murphy’s Law and are ultimately vulnerable to malfunctions. The good news is that due to the simplicity of their design troubleshooting these pumps is relatively straightforward. The next time your pond pump has issues, below are some things to consider before speaking with the manufacturer. Vapor locks result from air bubbles which become caught within the volute, or the main pump area. While the impeller will rotate, it won’t move water due to the air bubble. In this situation all you need to do is lift the pump underwater until the intake becomes upward, which will allow the escape of the air bubble. It is important to ensure the pump is receiving electricity. Look at the circuit breaker and ground fault to ensure they haven’t been tripped. You may also want to plug other appliances into the same outlet your pump uses to determine that power is being received. If not you will need to speak with an electrician. Look at the intake on the pump to see if there is debris that has become stuck in it. The majority of pumps will handle debris with ease, but sometimes detritus or a rock could become lodged and then interferes with the intake and impeller. Make sure the intake is cleaned and clear. It is also important to flush the pump. The best way to do this is by disconnecting the fitting which rests on top of the check valve, allowing the water to flow out of the system and to the skimmer box, eradicating any clogs. Once the pump has been inspected and cleaned, give it another try. If the impeller is working but does not spin whenever you plug it in, you should try using a different electrical outlet. This should be an outlet with a GFCI, or ground fault. Plug the pump in the outlet and if it still does not work or it trips the ground fault, this means there is a good chance the pump has malfunctioned. If the pump works then that means there is something wrong with the flow of electricity to the pond, in which case you will need to call an electrician. Issues involving the flow of water are one of the most common problems you’ll encounter with pond pumps. The pump won’t push water when it isn’t accessible. So you will first want to determine if there are objects which are preventing water from reaching the pump, which could be leaves, rocks, debris or a skimmer net that has become clogged. Sometimes cleaning the skimmer mat is all that is needed. There are times when a pond will have low water levels, which keeps the pump from getting a sufficient amount of water to the skimmer.